Current availability of authentic Chinese ingredients in the UK (and US) means that Dunlop didn't have to shirk from using unsual or obscure ingredients. Where she substitutes a Western ingredient or modifies a recipe, she explains this in the recipe description. The beginning of the book covers Sichuan's distinctive cooking methods and common ingredients. The really wonderful thing about the ingredient list and recipes is that the names are giving in English, Pinyin, and Chinese (in either Mandarin or the Sichuan dialect). So when you're having a hard time spotting silver ear fungus or the tsao-kuo on the shelves at your local Chinese grocery store, you'll be able to get a Chinese speaker to help you. Joe adores the flavor of Sichuan peppercorns and the mouth numbing sensation that a whole load of them can bring on. I like a little, not too much. 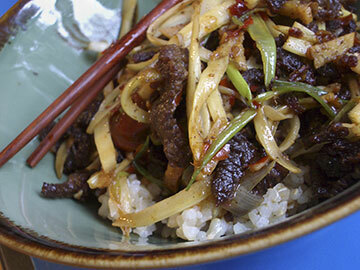 This recipe fits that bill perfectly and uses the Sichuan dry frying cooking method. Cut beef into thin slices, and cut across the grain into slivers about 1/4 inch thick. Discard fat and grisley bits. Scrape off the tough outer strings of the celery stalk then chop into 3 inch sections. Cut these sections lengthwise into thin slivers. Sprinkle with a 1/4 tsp salt to draw out the water and set aside. Peel ginger and slice it into fine slivers. Cut scallion whites into fine slivers to match the ginger. Add 1/3 C peanut oil to seasoned wok. Heat over high until smoking then add beef and mix well. The oil will turn cloudy. Stir-fry constantly until the liquid clears and the beef has lost most of its water content and is beginning to crisp up. (Around 10 minutes.) As the meat dries out, splash the Shaoxing rice wine around the edges of the wok and let it sizzle. When the oil is clear, turn heat down to medium. Push beef up the sides of the wok and leave the oil. Add the chili bean paste to the oil. Stir-fry about 30 seconds until oil is red and fragrant. Add ginger and scallions, mix and stir-fry about 10 more seconds until ginger is fragrant. Add celery strips, soy sauce, salt to taste (I didn't add any extra salt) and stir-fry until celery is just cooked. Stir in sesame oil and put on serving plate. Drizzle with optional chili oil and sprinkle with Sichuan peppercorns. Yum! We haven't tried this recipe yet but will soon. Fuschia Dunlop's book is the best.